Right in the heart of mountains called “Alps of Japan“, in the north of the ancient province of Shinano, corresponding to the southern part of present Nagano city, there is the valley of Kawanakajima, where the Chikumagawa and Saigawa rivers meet. Kawanakajima (literally ‘island between the rivers’) was the battlefield of at least five battles between Uesugi Clan and Takeda Clan, led by the two legendary Daimiyo Uesugi Kenshin and Takeda Shingen. 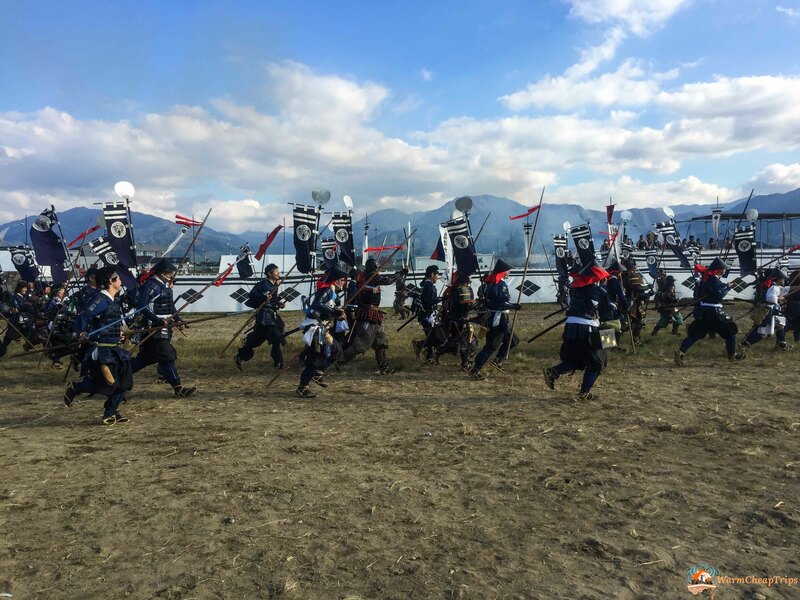 The battles of Kawanakajima are one of the most beloved and recounted sagas of Samurai and even today this story fills the hearts of the Japanese and every year in the city of Fuefuki, in the prefecture of Yamanashi, the re-enactment of the Battle of Kawanakajima recalls many visitors and fans. 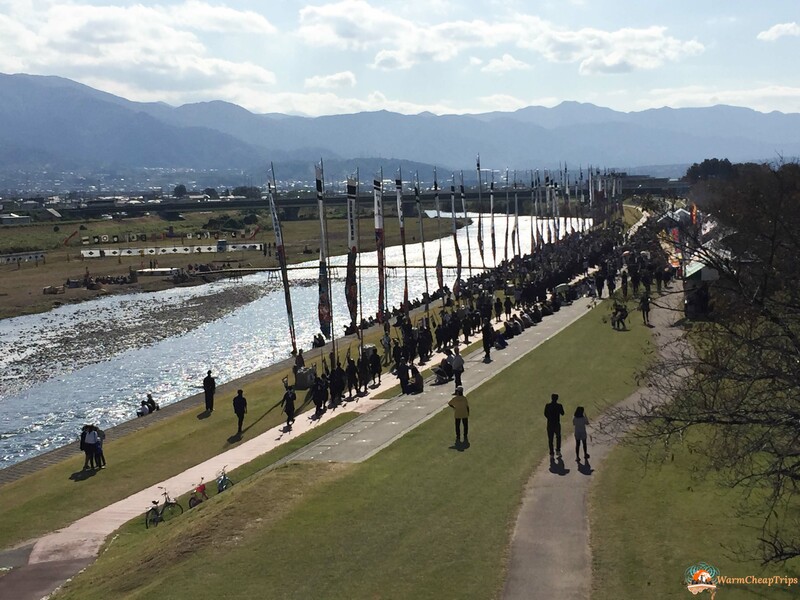 Not only a large audience crowds the battlements along the river where the re-enactment takes place, but also almost a thousand people join to support the experts, turning into faithful warriors of the Takeda and Uesugi clans. The Kawanakajima valley has a triangular shape and has each side flanked by the mountains. The Saigawa River flows north into the plain to the east and creates a kind of natural border. The Chikumagawa river that flows from the southwest to the northeast ends up flowing into the Saigawa, skirting the southern mountain range, preventing access to the plain from any armies coming from the south. All these geographical features make the Kawanakajima valley a truly difficult land of conquest. Just south of Chikumagawa River, Takeda Shingen built a fortress, Kaizu Castle (in the current city of Mutsushiro), which was the Takeda outpost against the Uesugi. North of the Seigawa, at the top of the northern mountains, is the great Zenko-ji Buddhist temple (still one of the most important and famous temples in Japan, surrounded by the modern city of Nagano), owned by the Uesugi. The history of the Battles of Kawanakajima is therefore the story of two powerful clans on the borders of their geographical domains, whose territories were established and protected by the two mountain ranges whose passes allowed access to the provinces of Kai (Takeda clan, today’s prefecture of Yamanashi) and Echigo (Uesugi clan, current prefecture of Niigata). 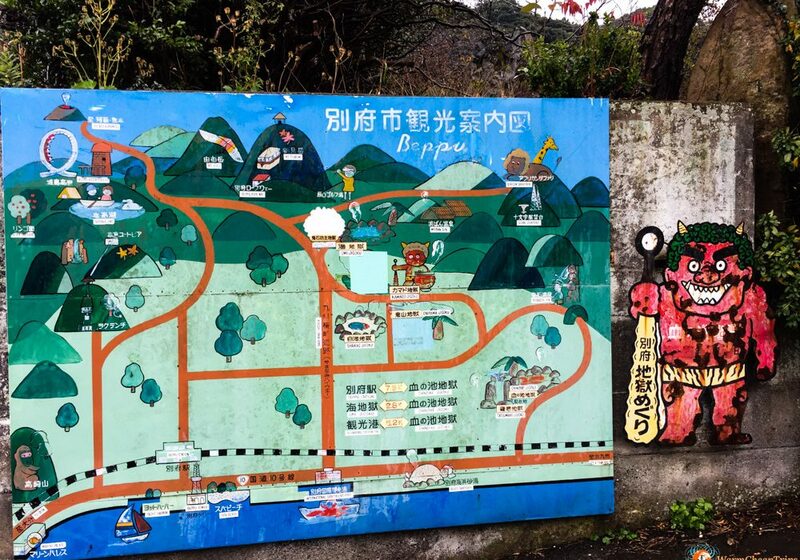 Kawanakajima was a no man’s land, a very fertile area, well connected with all the surrounding valleys and also in a very important position from a strategic / military point of view for medieval Japan (today it remains famous as center of fruit and vegetable production). The battles of Kawanakajima were fought during the Sengoku period of the history of Japan (1467-1603), ie the period when the central military authority (Shogunato Ashikaga) lost much of its ancient prestige, and in a short time emerged many strong local figures who led their clans to the ascent of military power, in order to fortify their dominions and perhaps aspire to create a new dynasty of Shogun. 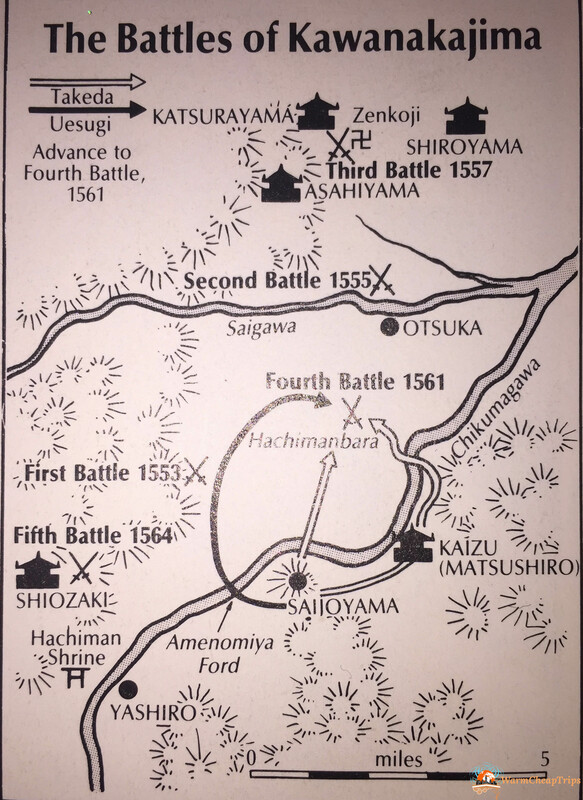 The five great battles of Kawanakajima took place in 1553, 1555, 1557, 1561 and 1564. The trigger that led to the explosion of these battles were the various campaigns of military expansion carried out by the two clans, until they inevitably found themselves facing each other. In particular, Takeda Shingen conquered the province of Shinano, defeating many clans and forcing on the escape Murakami Yoshikiyo and Ogasawara Nagatoki, two minor Daimiyo, who, needing help, allied with Uesugi Kenshin, who was the powerful Takeda clan now at the gates, he decided to intervene. The first three battles ended without a real winner, and in some cases they were simple skirmishes. This was due to the fact that both leaders were very cautious, respecting and fearing each other, they preferred to postpone the true battle until the moment considered most appropriate. The fifth and last battle followed the same script of the first three, with the two armies that remained one on front of the other for 60 days only divided by the river Saigawa, until they decided to retire. Once again there were no conditions to unbalance the enemy’s defenses and no possibility of creating the surprise effect necessary to create a breach in the enemy lineup. The Battle of Kawanakajima to be passed to history is therefore the fourth, which took place in September 1561, and has entered in the legend of the Samurai battles. This battle involved huge troop losses for both sides and saw involved armies of a size rarely seen until then and is still today considered one of the tactically most interesting battles of the Sengoku period. In September 1561, Uesugi Kenshin left his castle of Kasugayama with 18,000 warriors, determined to find a decisive battle with Takeda Shingen. He keeps some of his forces, about 1/4, at the Zenkoji Temple, in order to cover a possible desperate retreat within their territories. Having done so, he decided to take up position with the main contingent on Mount Saijoyama (about 500m), a mountain overlooking the castle of Kaizu in the hands of Shingen to the west, which he considered the key to victory. The Uesugi armies then cross both the Saigawa and Chikumagawa, and arrive on the chosen mountain reinforce it with field fortifications. Although Kenshin was unaware of it before leaving, Kaizu’s castle contained no more than 150 Takeda samurai upon his arrival, and these had been completely taken by surprise. The general at the head of the Kaizu garrison, Kōsaka Danjō Masanobu, one of the most trusted commanders in Shingen, throught a fire signals system, was able to inform his master in the Tsutsujigasaki fortress at Kōfu in just two hours, 150 km away, of the unexpected advanced Uesugi. Uesugi Kenshin, realizing the tripped alarm, did nothing to try to stop the signal fires, he was determined to close the game with an epic field clash, and was convinced that by luring Shingen into the Kaizu castle and attacking him from his elevated position on Mount Saijoyama he would have overwhelmed him. Shingen received the news, quickly left Kōfu with 16,000 men, who will increase by an additional 4,000 units in the journey through the province of Shinano. After 24 days of travel, he arrives at Kawanakajima on the west bank of the Chikumagawa River. Having intuited the intentions of the adversary he makes sure to keep the river between him and the mountain Saijoyama, to avoid a sudden attack. For 5 days none of the armies takes the initiative, Shingen then decides to enter with his troops in the fortress of Kaizu from where he intended to prepare to repel the assault. Once he entered the castle, with his gun-bugyo (army commissioner), Yamamoto Kansuke, he decided instead to implement a strategy to tighten Kenshin’s forces. Following the plan designed by Yamamoto, Kōsaka Danjo Masanobu, the general of the castle garrison, leaves Kaizu with 8,000 men, advancing towards the back of Saijoyama mountain using the cover of the night and using no torch to avoid being detected. The aim of this move is to attack from behind the Uesugi in order to surprise them and force to descend precipitously from the mountain, force them to cross the river Chikumagawa and push the army of Kenshin towards the plain where Takeda Shingen, who moved in the night, crossing the river and settling in the attack position called Kakuyoku (the best in terms of the encirclement of a rapidly advancing enemy), he waits for it with another 8,000 Samurai in a deadly grip created by the two Takeda armies, from the river and above all from the surprise due to this perfect trap. However, Kenshin, through his spies inside the castle of Kaizu, and thanks to explorers posted to Saijoyama, senses the intentions of Shingen. Kenshin then in turn turns his men to the plains coming down from the western side of the Saijoyama, silently crawling and using pieces of cloth to muffle the sound of horses’ hooves. With the arrival of dawn on October 18, 1561, the men of Shingen, who expected to see the Uesugi army en route, find themselves facing the entire army of Kenshin, deployed and ready to charge. The forces of Uesugi Kenshin begin to attack in waves, in a formation called “Kuruma Gakari”, which provides for the continuous rotation of the divisions worn down by the clash with other fresh kept at rest. Leading Uesugi’s avangaurdia is one of his historic twenty-eight generals, Kakizaki Kageie. 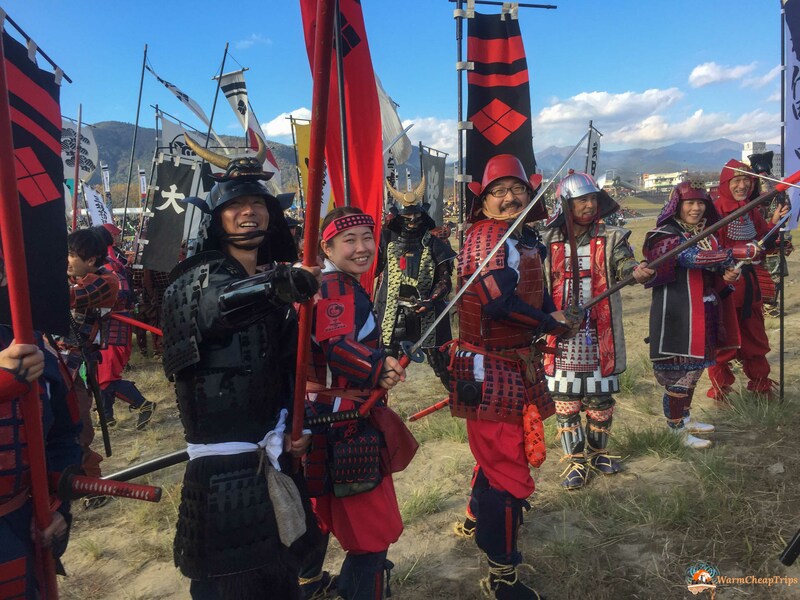 The samurai unit riding Kakizaki will clash with the troops of Takeda Nobushige, Shingen’s brother, who will lose his life in the next terrible face to face fight. The kakuyoku formation, even if in reality had been chosen to best accommodate an army in disarray, surprisingly holds up the opponent’s impact to the maximum of its power, but unfortunately for Shingen, the Takeda commanders start to fall, one by one . Seeing that his pincer tactics had failed, Yamamoto Kansuke (the creator of the Takeda strategy) decided to take full responsibility for what at the time seemed to be an irreparable disaster, alone he loaded the mass of samurai Uesugi with his head down, after having suffered more than 8 bullet wounds and cutting weapons, he retired to a nearby hill and committed seppuku (ritual suicide), he was 69 years old. The situation is getting worse for the Takeda who continue to suffer serious losses among the commands. The Uesugi forces continue to advance until they even reach the Shingen command tent. Right now there is one of the most memorable individual fights in the entire Samurai story, as two Daimiyos rarely found themselves battling in close combat. Uesugi Kenshin in person bursts into the headquarters, attacking Takeda Shingen who, caught unawares has no time to pull his sword, but manages to ward off several shots with the heavy war fan, with which he was giving orders to his tried army, and resist against Kenshin until the arrival of one of the men of his guard who, gripped by a spear, attacked Uesugi Kenshin. The blade of the spear rebounded on Kenshin’s armor and hit the horse causing him to back out, at which point the other bodyguards had arrived, Takeda Shingen was dismissed and Uesugi Kenshin retired. Shingen on this occasion, thanks to his incredible martial skills, stopped seven strokes of the sword with the fan and three exploiting his armor. Takeda’s main contingent continued to resist, despite the fierce waves attacks by Uesugi, forcing the main force of Uesugi back to the Chikumagawa river. Meanwhile, the Kōsaka troops, after reaching the top of Saijoyama Mountain and finding the deserted Uesugi station, understood the serious danger their leader was running and rushed to the river, following the same path that their plans should have followed by thr retreating Uesugi army. Near the river they collide with the 3,000 troops under the command of General Amakazu Kagemochi, who remained there to intervene if this situation had occurred, and defeated them in a desperate clash. Then they advanced further to come to the aid of the central body of the Takeda army, attacking from the rear the troubled Uesugi troops. At the end of the battle, there were numerous Takeda generals who liyed in the field, including his younger brother Takeda Nobushige and his uncle Murozumi Torasada. The Uesugi army recorded losses equal to 72% of the total, the Takeda, although winners of the battle, lost 62% of the men, including many important generals. The chronicles of the time indicate that Takeda made no attempt to prevent the retreat of the Uesugi troops after the battle, which burned the camp at Saijoyama, returned to the Zenko-ji temple, and from there to the Province of Echigo. We can’t know if it was a gesture dictated by respect for the enemy or the bad conditions of his army. In the city of Fuefuki, in the heart of Takeda’s ancient possessions just over an hour and a half from Tokyo, every autumn this exciting battle relieves with a thousand figurants divided between armies of Takeda and Uesugi and recall the highlights of this battle, such as the famous meeting between the two Daimiyo. Samurai armor, katana, horses, banners and drums fill the banks of the river that runs through Fuefuki and the battle of Kawanakajima rages in front of the spectators’ eyes. 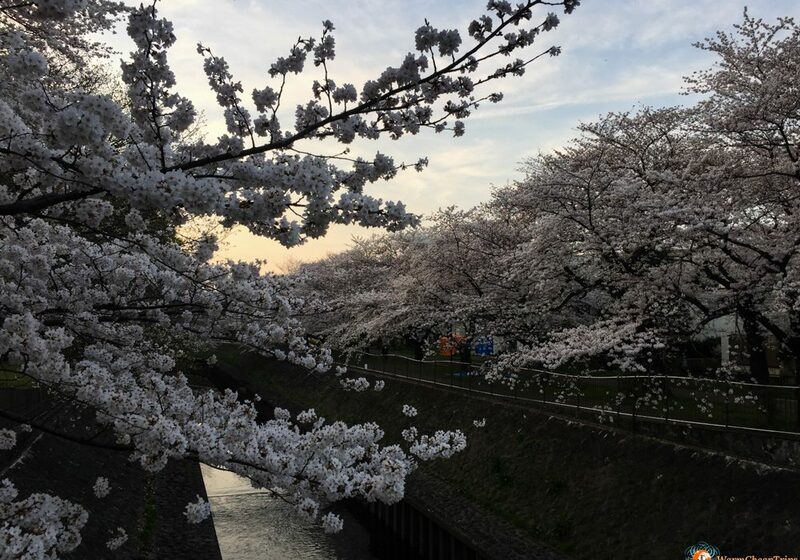 Experienced actors fight on the bridge, in the river and in the center of the scene while all around about 900 ordinary people become Samurai for a day, brandishing Yari and Katana and waving for the flag of their clan on their backs. The partecipants in this adventure, meet their own clan in one of the two collection points, where preparation for the battle is done wearing armor and socializing with fellow soldiers. Then, division by division, makes the war promises to the Daimiyo. 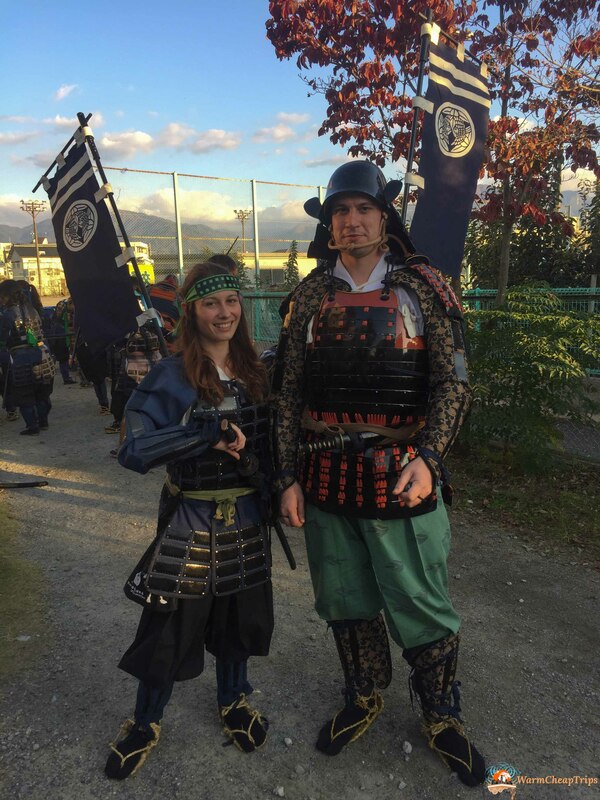 After lunch, we are ready to leave for the river, and the Samurai walk the streets of Fuefuki between the incitement and the “Ganbatte” of citizens and spectators. 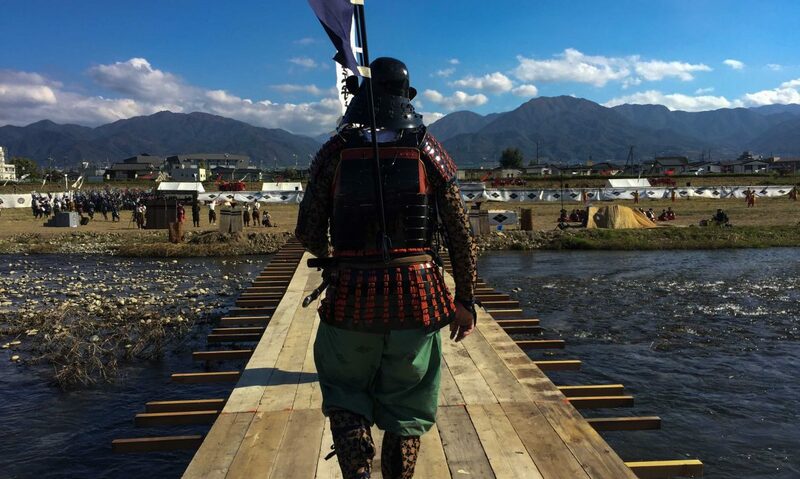 Moving between streets and modern cars wearing a Samurai armor and with straw sandals on feet is quite funny, but once get to the river and cross the simple wooden bridge that leads to the battlefield, the emotion grows and drag you in the spirit of the battle! So begins the re-enactment of battle of Kawanakajima, with the protagonists who act the words of the narrator until the first charge of the Uesugi against Takeda, then a second, and then again …. from the stands we can see the confusion of the battle , while on the field the actors face each other in duels with the sword, the partecipants in the background are entangled with each other between charges, fake killings, photoes and difficulty of walking the less athletic and not accustomed to move with all the Samurai equipment on . 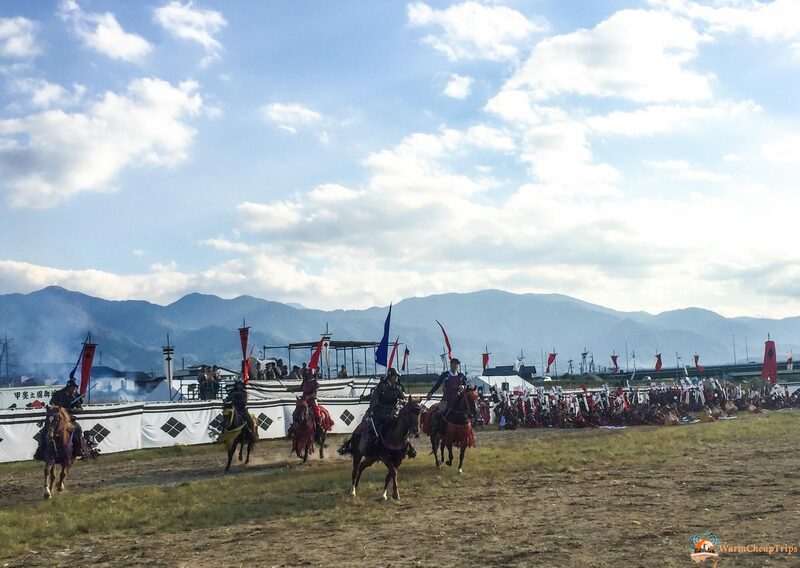 The atmosphere is hot and it’s time for the highlight of the battle of Kawanakajima: the attack on Kenshin in the Shingen command tent! A moment of great emotion for the public and participants, who are preparing for the grand finale, before retiring to their territories. It was a pleasure for us to take part in this re-enactment and experience the atmosphere of events like this and we thank the city of Fuefuki for its hospitality. If you speak to Japan, do not miss the chance to attend an event and why not, experience it in person. You can find more information on the Fuefuki website (in Japanese) or follow the updates on the Facebook page The Peach City Fuefuki. 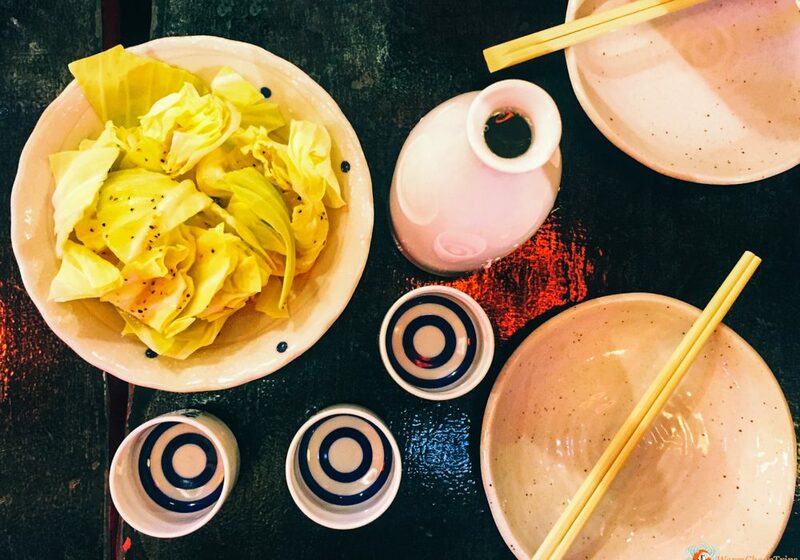 The town of Fuefuki is located on the Chuo Line and Isawa Onsen is the most convenient stop. Just a few stations away there are the city of Yamanashi and the city of Kofu and the area is full of temples linked to the Takeda family. From Shinjuku the express trains Kaji and Azusa reach the station in about 90 minutes and are covered by the Japan Rail Pass. Alternatively, you can use local, cheaper trains, changing to Takao and taking just over two hours. Less frequent buses always leave from Shinjuku station and take two hours to Isawa Onsen.